Knowledge about military technology of the Viking Age (end of 8th- to mid-11th-century Europe) is based on relatively sparse archaeological finds, pictorial representation, and to some extent on the accounts in the Norse sagas and laws recorded in the 14th century. According to custom, all free Norse men were required to own weapons, as well as permitted to carry them at all times. Indeed, the Hávamál, purported to be sage advice given by Odin, states "Don't leave your weapons lying about behind your back in a field; you never know when you may need all of sudden your spear." As war was the most prestigious activity in Viking Age Scandinavia, beautifully finished weapons were an important way for a warrior to display his wealth and status. A wealthy Viking would likely have a complete ensemble of a spear, a wooden shield, and either a battle axe or a sword. The very richest might have a helmet; other armour is thought to have been limited to the nobility and their professional warriors. The average farmer was likely limited to a spear, shield, and perhaps a common axe or a large knife or seax. Some would also bring their hunting bows (mostly long bow or flat bow) to use in the opening stages of battle. The bow and arrow was used both for hunting and in battle. They were made from yew, ash or elm. The draw force of a 10th-century bow may have reached some 90 pounds force (400 N) or more, resulting in an effective range of at least 200 metres (660 ft) depending on the weight of the arrow. A yew bow found at Viking Hedeby, which probably was a full-fledged war bow, had a draw force of well over 100 pounds. Replica bows using the original dimensions have been measured to between 100–130 pounds (45–59 kg) draw weight. A unit of length used in the Viking Age called a bow shot corresponded to what was later measured as 227.5 metres (746 ft). Illustrations from the time show bows being pulled back to the chest, rather than to the corner of the mouth or under the chin, as is common today. The earliest find of these relics were found in Denmark, seemingly belonging to the leading-warrior class based on the graves in which they were found. The spear was the most common weapon of the Scandinavian peasant class. Throwing spears were constantly used by the warrior class; despite popular belief, it was also the principal weapon of the Viking warrior, an apt fit to their formations and tactics. They consisted of metal heads with a blade and a hollow shaft, mounted on wooden shafts of two to three metres in length, and were typically made from ash wood. The spear heads could measure between twenty and sixty centimetres with a tendency towards longer heads in the later Viking Age. Spear heads with wings are called krókspjót (hooked spear) in the sagas. Some larger-headed spears were called höggspjót (chopping spear) and could also be used for cutting. The barbed throwing spears were often less decorated than the ostentatious thrusting spears, as the throwing spears were often lost in battle. Compared to a sword, the spear can be made with inferior steel and far less metal overall. This made the weapon cheaper and probably within the capability of a common blacksmith to produce. Despite this, the spear held great cultural significance to the Viking warrior, as the primary weapon of Odin, the king of the Norse gods and the god of warfare, was the spear Gungnir. The Eyrbyggja saga alludes that a customary start to a battle included throwing a spear right over the enemy army to claim it for Odin. Possibly due to its cultural significance, pattern welded blades are common in spear heads, and the sockets were often decorated with silver inlaid patterns. A polearm known as the atgeir is mentioned in several sagas of Icelanders and other literature. Atgeir is usually translated as "halberd", akin to a glaive. Gunnar Hámundarson is described in Njáls saga as cutting and impaling foes on his atgeir. Several weapons (including the kesja and the höggspjót) appearing in the sagas are Viking halberds. No weapon matching their descriptions have been found in graves. These weapons may have been rare, or may not have been part of the funerary customs of the Vikings. Two distinct classes of knives were in use by Vikings. The more common one was a rather plain, single edge knife of normal construction, called a knifr. These are found in most graves, being the only weapon allowed for all, even slaves. Smaller versions served as the everyday utility tool, while longer versions were likely meant for hunting or combat or both. Weapon knives sometimes had ornamental inlays on the blade. The construction was similar to traditional Scandinavian knives. The tang ran through a more or less cylindrical handle, the blade was straight with the edge sweeping upward at the tip to meet the back of the blade in a point. The knife apparently played an important role for all Scandinavians. This is evidenced by the large number of knives found in burial sites of not just the men, but the women and children too. The Seax was in widespread use among the Migration period Germanic tribes, and is even eponymous of the Saxons. It appears in Scandinavia from the 4th century, and shows a pattern of distribution from the lower Elbe (the Irminones) to Anglo-Saxon England. While its popularity on the continent declines with the end of the Migration period, it remained in the British Isles where it was taken up by the Vikings. 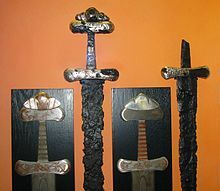 The large, sword-like seaxes are primarily found in connection with Viking settlements in England and Ireland, but do not appear very commonly in Scandinavia. Swords were very costly to make, and a sign of high status. They were rarely used and some swords found in graves were probably not sturdy enough for battle or raiding, and instead were likely decorative items. Like Roman spathae, they were worn in leather-bound wooden scabbards suspended from a strap across the right shoulder. Early blades were pattern welded, a technique in which strips of wrought iron and mild steel were twisted and forged together, with the addition of a hardened edge. 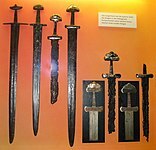 Later blades of homogeneous steel, imported probably from the Rhineland, many bearing inlaid makers' marks and inscriptions, such as INGELRII or VLFBERHT. Local craftsmen often added their own elaborately decorated hilts, and many swords were given names, such as Leg-biter and Gold-hilt. The sword grip was usually made of an organic material, such as wood, horn, or antler (which does not often survive for archaeological uncovering), and may well have been wound around with textile. Owning a sword was a matter of high honour. Persons of status might own ornately decorated swords with silver accents and inlays. Most Viking warriors would own a sword as one raid was usually enough to afford a good blade. Most freemen would own a sword with goðar, jarls and sometimes richer freemen owning much more ornately decorated swords. The poor farmers would use an axe or spear instead but after a couple of raids they would then have enough to buy a sword. One sword mentioned in the Laxdæla saga was valued at half a crown, which would correspond to the value of 16 milk-cows. Constructing such weapons was a highly specialized endeavour and many sword-blades were imported from foreign lands, such as the Rhineland. Swords could take up to a month to forge and were of such high value that they were passed on from generation to generation. Often, the older the sword, the more valuable it became. A distinct class of early single edged swords is known from Eastern Norway at the time. These had the same grips as the double edged swords, and blades of comparable length. The blades varied from long and slim, like the more common two edged swords, to somewhat heavy, giving the weapon a more cleaver-like balance. Confusingly, the same finds are sometimes classified as "sabres" or "seaxes" in English literature. As mentioned above, a sword was so valued in Norse society that good blades were prized by successive generations of warriors. There is even some evidence from Viking burials for the deliberate and possibly ritual "killing" of swords, which involved the blade being bent so that it was unusable. Because Vikings were often buried with their weapons, the "killing" of swords may have served two functions. A ritualistic function in retiring a weapon with a warrior, and a practical function in deterring any grave robbers from disturbing the burial in order to get one of these costly weapons. Indeed, archaeological finds of the bent and brittle pieces of metal sword remains testify to the regular burial of Vikings with weapons, as well as the habitual "killing" of swords. The most common hand weapon among Vikings was the axe – swords were more expensive to make and only wealthy warriors could afford them. The prevalence of axes in archaeological sites can likely be attributed to its role as not just a weapon, but also a common tool. This is supported by the large number of grave sites of female Scandinavians containing axes. Several types of larger axes specialized for use in battle evolved, with larger heads and longer shafts, including various types of bearded axes. The larger forms were as long as a man and made to be used with both hands, called the Dane Axe. Some axe heads were inlaid with silver designs. In the later Viking era, there were axe heads with crescent shaped edges measuring up to 45 centimetres (18 in) called breiðöx (broadaxe). The double-bitted axes depicted in modern "Viking" art would have been very rare as it used more material and was seen as a waste during hard times, if they existed at all. No surviving examples, authentic artwork or clear descriptions from records support the existence of double-bitted axes used by vikings. The Viking age sling was without a doubt the easiest for the manufacturer to produce, simply consisting of a rope and sometimes a leather cup to assist with the loading, the rope was often easily obtained, giving many of the lower class men and women easy access to a formidable weapon. The sling would have been mostly used by the lower class, peasants and farmers, for example. The sling can be used in offensive as well as defensive manoeuvres. Slingers were very manoeuvrable warriors due to their lack of equipment. The shield was the most common means of defence. The sagas specifically mention linden wood for shield construction, although finds from graves show mostly other timbers, such as fir, alder and poplar. These timbers are not very dense and are light in the hand. They are also not inclined to split, unlike oak. Also, the fibres of the timber bind around blades preventing the blade from cutting any deeper unless a lot more pressure is applied. In conjunction with stronger wood, Vikings often reinforced their shields with leather or, occasionally, iron around the rim. Round shields seem to have varied in size from around 45–120 centimetres (18–47 in) in diameter but 75–90 centimetres (30–35 in) is by far the most common. The smaller shield sizes came from the pagan period for the Saxons and the larger sizes from the 10th and 11th centuries. Most shields are shown in illuminations as being painted a single colour although some have a design painted onto them; the most common designs are simple crosses or derivations of sun wheels or segments. The few round shields that survived have much more complicated designs painted on them and sometimes very ornate silver and gold work applied around the boss and the strap anchors. The Gokstad ship has places for shields to be hung on its railing and the Gokstad shields have holes along the rim for fastening some sort of non-metallic rim protection. These were called shield lists and they protected ship crews from waves and the wind. Some Viking shields may have been decorated by simple patterns although some skaldic poems praising shields might indicate more elaborate decoration and archaeological evidence has supported this. In fact, there is a complete subgenre of Skaldic poetry dedicated to shields, known as "shield poems", that describe scenes painted on shields. For example, the late-9th-century skaldic poem, Ragnarsdrápa, describes some shields painted with mythological scenes. 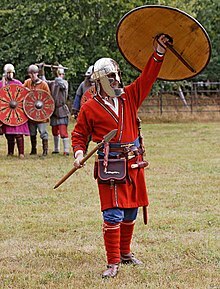 Viking shields were also heavily used in formations. The shield wall or skjaldborg was a main formation in which accomplished Viking warriors would create a line of interlocked shields and thrust spears at adversaries. Other notable tactics included the svinfylking "boarsnout", in which warriors would create a wedge configuration and attempt to burst through the front line of nearby foes. It has been proposed that the medieval era kite shield favoured by the Normans was introduced to Europe by the Vikings. However, no documentation or remains of kite shields from the Viking period have been located by archaeologists. The remains of five helmets from the Viking Age are known to exist: the Tjele helmet fragment, two fragments from Gotland, one fragment from Kiev, and the Gjermundbu helmet. Only the remains from Gjermundbu were capable of reconstruction. It was excavated on a farm called Gjermundbu in Ringerike in central Norway. Gjermundbu is located in Haugsbygd, a village in northeast of Hønefoss, in Buskerud, Norway. The helmet dates to the 10th century. 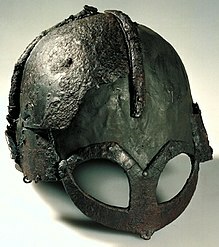 This helmet was made of iron from four plates after the spangenhelm pattern. This helmet has a rounded cap, and there is evidence that it also may have had a mail aventail. It has a "spectacle" guard around the eyes and nose which formed a sort of mask, which suggests a close affinity with the earlier Vendel Period helmets. From runestones and other illustrations, it is known that the Vikings also wore simpler helmets, often caps with a simple noseguard. Research indicates that Vikings may have only rarely used metal helmets. Helmets with metal horns, presumably for ceremonial use, are known from the Nordic Bronze Age, 2,000 years prior to the Viking Age. Despite popular culture, there is no evidence that Vikings used horned helmets in battle as such horns would be impractical in a melee, but it is possible that horned head dresses were used in ritual contexts. The horned and winged helmets associated with the Vikings in popular mythology were the invention of 19th-century Romanticism. The horned helmet may have been introduced in Richard Wagner's Ring opera: The male chorus wore horned helmets, while the other characters had winged helmets. Once again, a single fragmented but possibly complete mail shirt has been excavated in Scandinavia, from the same site as the helmet—Gjermundbu in Haugsbygd. Scandinavian Viking Age burial customs seems to not favour burial with helmet or mail armour, in contrast to earlier extensive armour burials in Sweden Valsgärde or possibly only a small amount of Vikings could afford it. Probably worn over thick clothing, a mail shirt protected the wearer from being cut, but offered little protection from blunt trauma and stabbing attacks from a sharp point such as that of a spear. The difficulty of obtaining mail armour resided in the fact that it required thousands of interlinked iron rings, each one of which had to be individually riveted together by hand. As a result, mail was very expensive in early medieval Europe, and would likely have been worn by men of status and wealth. The mail worn by Vikings was almost certainly the "four-on-one" type, where four solid (punched or riveted) rings are connected by a single riveted ring. Mail of this type is known as a byrnie from Old Norse brynja. Given that Vikings on a raid tried to avoid pitched battles, it's possible that mail was primarily worn only by the professional warriors going into battle, such as the Great Heathen Army of the mid-9th century in England or at Harald Hardrada's invasion of Northumbria at the Battle of Stamford Bridge in 1066. More than 30 lamellae (individual plates for lamellar armour) were found in Birka, Sweden, in 1877, 1934 and 1998–2000. They were dated to the same approximate period as the Gjermundbu mailshirt (900‒950) and may be evidence that some Vikings wore this armour, which is a series of small iron plates laced together or sewed to a stout fabric or leather cats shirt. There is considerable debate however as to whether the lamellae in question were in the possession of a Scandinavian resident or a foreign mercenary. Quilted cloth (a gambeson) is conjectured as possible options for lower-status Viking warriors, though no reference to such are known from the sagas. Such materials survive poorly in graves, and no archaeological finds have been made. Some runestones depict what appears to be armour which is likely not chain mail. The armour in question may have been the lamellar armour mentioned above, or may not have been armour at all. Several layers of stout linen or hemp canvas would provide a good level of protection, at reasonable expense, as would winter clothing made from thick woollen cloth. Practical experience with maille also suggests an undergarment of some sort would have been worn between the maille and the regular tunic, to protect the latter from dirt and excessive wear, but the descriptions of the effect of axes in the Sagas indicate such garments were lightly padded if at all. Leather was far pricier during the period than today and thus less affordable for the casual warrior. In the Legendary Saga of St. Olaf, the kingsbane Thorir Hund is said to have worn a tunic made from reindeer fur, enchanted by "Finns" (Sámi), defending him from sword blows. The tunic is described as "magically" enhanced which may indicate that it may not represent a typical example of such a garment. Leather clothing does, however, occasionally turn up in archaeological finds, and would have offered some degree of protection in combat. All in all, the case for non-metal forms of armour remains inconclusive. It is likely that the average Viking fought whilst wearing ordinary clothing, with the shield as the only form of protection. Foreign-made, specifically Frankish, weapons and armour played a special role in Norse society. Norsemen attained them either through trade (an extension of gift-giving in Norse society) or as plunder. Therefore, their possession and display by any individual would signify their station in the social hierarchy and any political allegiances they had. One example of an exchange of weapons between the Franks and the Vikings occurred in 795 when Charlemagne exchanged weapons with the Anglo-Saxon king Offa of Mercia. Scandinavian affinity towards foreign arms and armour during the Viking Age had an eminently practical aspect. Norse weapon designs were obsolete and sources of iron within Scandinavia were of poor quality. Frankish swords like the VLFBERHT had a higher carbon content (making them more durable) and their design was much more manoeuvrable compared to Scandinavian-produced swords. Although smaller weapons like daggers, knives, and arrowheads could be manufactured in Scandinavia, the best swords and spearheads were undoubtedly imported. Many of the most important Viking weapons were highly ornate—decorated lavishly with gold and silver. Weapons adorned as such served large religious and social functions. These precious metals were not produced in Scandinavia and they too would have been imported. Once in Scandinavia, the precious metals would have been inlaid in the pommels and blades of weapons creating geometric patterns, depictions of animals, and (later) Christian symbols. Vikings also used foreign armour. According to Heimskringla, one hundred Vikings appeared "in coats of ring-mail, and in foreign helmets" at the Battle of Nesjar in 1016. During the mid-9th century, there was an influx of these high-quality weapons into Scandinavia, and Frankish arms became the standard for all Vikings. As Ahmad ibn Fadlan observed in his account of his journey to Russia, every Viking carried a "sword of the Frankish type". The Franks attempted to limit the Vikings' use of weapons and armour produced in Francia—fearing that they would eventually face equally armed opponents. Chapter 10 of the Capitulare Bononiense of 811 made it illegal for any clerical functionary to supply swords or armour to non-Frankish individuals. Laws like this were enacted throughout Francia. Ultimately, in 864, King Charles the Bald of West Francia made the practice punishable by death. Some scholars[which?] have proposed that such laws proved so effective at stemming the flow of Frankish weapons that they initiated the practice of raiding for which Vikings became notorious. ^ Poems of the Vikings: The Elder Edda: Havamal, Sayings of the High One. ^ a b c d e f Hayward, John (2000). Encyclopaedia of the Viking Age. New York: Thames & Hudson Inc. ISBN 0-500-01982-7. ^ a b c d Vike, Kim Hjardar and Vegard (2011). Vikinger i krig (Vikings at war) (in Norwegian). Oslo: Spartacus. ISBN 9788243004757. ^ Foote and Wilson, 275–76. ^ Silén, Lars (1983). "Några Reflektioner Angående Bilderna på Balingsta-Stenen i Uppland" (PDF). Fornvännen. Swedish National Heritage Board. 78: 88–91. Retrieved 2010-01-28. ^ Eyrbyggia Saga. Penguin Classic. ISBN 978-0-14-044530-5. ^ a b c d Holman, Katherine (2003). Historical Dictionary of the Vikings. Oxford: The Scarecrow Press, Inc. ISBN 0-8108-4859-7. ^ a b Kostveit, Ø. (1985). Norsk knivbok (in Norwegian). Oslo: Universitetsforlaget AS. p. 144. ISBN 82-00-07503-6. ^ a b c d e f g Hampton, Valerie Dawn (2011). "Viking Age Arms and Armor Originating in the Frankish Kingdom". The Hilltop Review. 4 (2): 36–44. ^ Oakeshott, R.E. (1996). The Archaeology of Weapons, Arms and Armour from Prehistory to[ the Age of Chivalry. New York: Dover Publications Inc. ISBN 978-0-486-29288-5. ^ "Viking Weapons and Warfare". BBC. 15 October 2010. Retrieved 15 November 2010. ^ a b Hall, Richard (2007). The World of the Vikings. New York: Thames & Hudson Inc. ISBN 0-500-05144-5. ^ Stephen V. Grancsav, “A Viking Chieftain’s Sword,” The Metropolitan Museum of Art Bulletin, XVII (March 1959), 181. ^ Roesdahl, [redaktion: Else (1992). Viking og Hvidekrist : Norden og Europa 800–1200 (in Danish, Swedish, and Norwegian). København: Nordisk Ministerråd. p. 428. ISBN 87-7303-556-4. ^ al., Michael D. Coe ... et (1996). Swords and hilt weapons (2nd ed.). London: Prion. p. 239. ISBN 1-85375-133-2. ^ Oxenstierna, Eric (1916). The Norsemen. Connecticut: New York Graphic Society Publishers, Ltd.
^ a b c d Pedersen, Anne (2008). "Viking Weaponry". The Viking World: ch 15. ^ a b "How the Vikings Worked". HowStuffWorks. 14 April 2008. Retrieved 15 November 2010. ^ Peter G. Foote and David M. Wilson, The Viking Achievement (New York, 1970), 278. ^ Sturluson, Snorri. The Prose Edda. ^ "Arms and Armour Part 8 Shields". Regia Anglorum. 10 December 2002. Retrieved 15 November 2010. ^ Foote and Wilson, 282–85. ^ Grotowski, Piotr (2009). Arms and Armour of the Warrior Saints: Tradition and Innovation in Byzantine Iconography (843–1261). Leiden: Koninklijke Brill NV. pp. 231–34. ISBN 978-9004185487. ^ "Archived copy". Archived from the original on March 25, 2009. Retrieved April 9, 2009. CS1 maint: Archived copy as title (link): "Picture: The world's only existing Viking Age helmet, from Gjermundbu in Ringerike"
^ Wester, K. (2000). The mystery of the missing Viking helmets. Neurosurgery, 47(5), 1216–29. ^ a b Ward, E. I. (2001). Viking Pop Culture on Display: The Case of the Horned Helmets. Material Culture Review/Revue de la culture matérielle, 54(1). ^ "Did Vikings really wear horns on their helmets?". The Straight Dope. 2004-12-07. Retrieved 2008-11-01. ^ a b Callmer, Johan (2008). "Scandinavia and the Continent in the Viking Age". The Viking World. ^ Pederson, Anne (2008). "Viking Weaponry". The Viking World: ch 15. ^ Callmer, Johan (2008). "Scandinavia and the Continent in the Vikings Age". The Viking World: ch 33. ^ Hedeager, Lotte (2008). "Scandinavia before the Viking Age". The Viking World: ch 1. ^ Ljungkvist, John (2008). "Handicrafts". The Viking World. ^ Ibn Fadlan (2005). Journey to Russia. New Jersey: Markus Wiener Publishers. p. 63. ^ "Capitulare Bononiense". Translations and Reprints. VI. Retrieved 2014-11-21. Ch. 10. It has been enacted that no bishop or abbot or abbess, or any rector or guardian of a church, shall presume without our permission to give or sell a byrnie or sword to any man outside, except only to his own vassals. Keynes, Simon and Lapige, Michael. Alfred the Great: Asser's life of king Alfred. New York: penguin Books, 1983, Print. Sprague, Martina. Norse Warfare.New York:Hippocrene Books Inc, 2007. print. This page was last edited on 7 April 2019, at 18:33 (UTC).